Congratulations to Bishop McNamara student Ainsley Spain '22 for her performance at 2019 Maryland State NASP® (National Archery in the Schools Program) Bullseye Championship and 3-D Challenge on March 16, 2019. 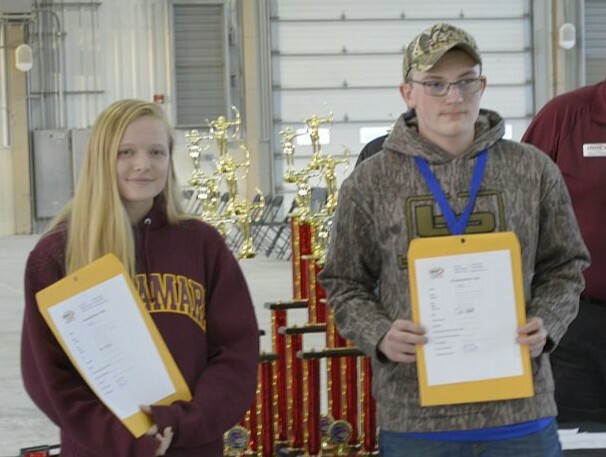 Ainsley took First Place in the 2019 Maryland National Archery NASP®/IBO 3-D Challenge in all Divisions of the Girls competition and 2nd place in the High School and 9th Grade Girls Divisions of the Bullseye Championship with a score of 281 out of possible 300. In addition, Ainsley received scholarship money for college along with her award. She has now been invited to participate in the National Tournament in Louisville, KY in early May. Ainsley and her mother, Deanna Warnock of the BMHS Admission's Office, and her father, alumnus Marty Spain '95, traveled to Westminster, Maryland for the State Championship. She will continue to compete through the country over the next months. Ms. Brenda Stephens, Physical Education/Health Department Chair, is working very hard, with the help of Ms. Warnock and Ainsley Spain, to make this a team sport at BMHS instead of a club. The Bishop McNamara Team practices on Gold days and this is the first year that we have sent students to participate in tournaments throughout Maryland. We have two students participating in Tournaments this Winter; besides Ainsley Spain, Emma Purath '20 has also been competing. Ainsley was previously part of the Archbishop Neale School Archery Team for MS. In 2015, she placed 2nd in Elementary Girls going on to Nationals in Louisville, KY, and then in 2016, placed 1st in Middle and Overall Girls for Maryland also going on to Nationals in Louisville. For more on the BMHS Archery Team, contact Physical Education/Health Department Chair, Ms. Brenda Stephens. Great Job Ainsley and keep up the great work! "It's more than just a bow and arrows...An activity that doesn't discriminate based on popularity, athletic skill, gender, size, or academic ability. It's a different kind of team sport. It's open to any student. Its biggest supporters are professional educators. Teams come together around one thing: archery. The National Archery in the Schools Program is an in-school program aimed at improving educational performance among students in grades 4th - 12th. And through it students are learning focus, self-control, discipline, patience, and the life lessons required to be successful in the classroom and in life." "The only bow used in NASP® is a "Genesis®" compound which has no let-off and is adjustable from 10-20 pounds in draw weight at any draw length."